Pretty close to a mint clone of a Nord Lead, but with additional LFOs, and instead of a gate sequencer, a pattern LFO. 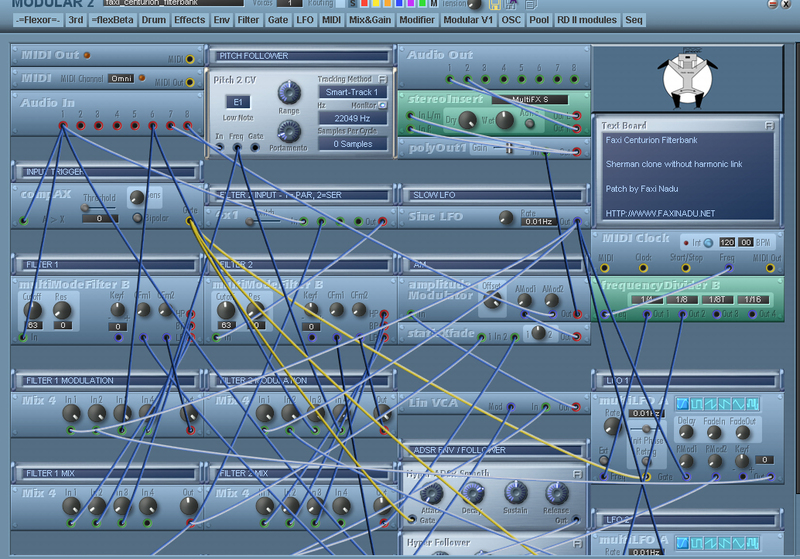 Also lacks the chorus and delay effects, but the phaser is in there. The routing of the modulators is a bit different due to the fact I added extra LFOs. Otherwise it is pretty much a Lead. I have also routed all 18 Nord Modular assignable knobs, so even though you will need the pc for editing, you can still do tons to the sound with the knobs. This one is a Sherman Filterbank clone, without the harmonic links between the filters. I have found a way to implement this, but it makes the patch much bigger and decided it is more streamlined and useful this way. I might post harmonically linked filters in another patch in the future. For this one you also need the Adern Flexor addon pack for SC Modular. And related, since the g2 is no longer in production or really supported for any development, I've thought a set of modules for SCOPE that recreated all the Nord modules would be a great addition...and whip up a tool to auto convert Nord to SCOPe, and we'd have an instantly LARGE collection of pathces (large meaning > 50,000). Great patch. After crashing Scope 3 times, I figured the Nord wasn't suppose to be in Scope. happy you like it, it is a bit fiddly to program around was afraid people would be like "huh? wtf does this do what for", but so is the real filterbank. that mixing of lp/bp/hp together is something we don't see so much in filters these days. btw a nord emulation in scope is ironically even easier than doing it in the nord modular (although of course in nm it will have a real close sound to the lead while in scope it will sound like a scope machine). you want a nord lead patch? to me the nord is not the warmest sounding synth, but it can do bubbly, textures, and other things very very well. faxinadu wrote: That mixing of lp/bp/hp together is something we don't see so much in filters these days. I actually became intrigued with mixing of FIlters at Assafs Synthschool Classes, and some Flexor Patches. 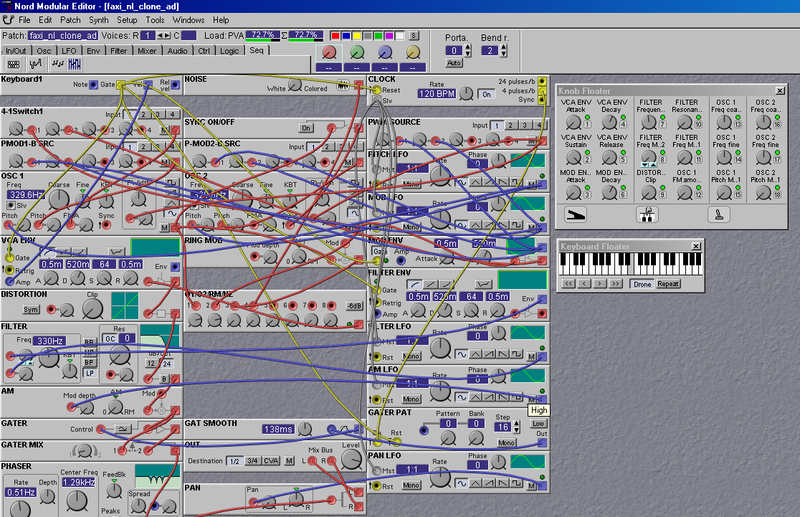 I actually have patches in Solaris hardware synth where I run 4 Parallel Filters, and as in the Filter alone each one sounds different, sometimes insect-y, but it's the mixing of the several Filters that gets such a full sound. faxinadu wrote: btw a nord emulation in scope is ironically even easier than doing it in the nord modular (although of course in nm it will have a real close sound to the lead while in scope it will sound like a scope machine). you want a nord lead patch? YES Please. I'd love a nord lead patch for scope modular. Thanks for all the other patches you've posted. I really enjoy all of them. Without would be more helpful to more people I personally don't have flexor yet. I'd personally love a version with FleXor. I just bought it a few months ago and I'm still learning. Having a patch that I want to play and be able to study is ideal but I'll be happy with whatever you post. I never had a NordLead but always I liked them Great idea to make one in modular. Thanks for sharing! The files are no longer available. May I ask some king soul to provide a valid link, please? hey mate, this should be in one of our modular packs, i think either in united faxi planets or the one tree pack. Thank you Faxi. I'll take a look in those files. Maybe it has another name, but I cannot find the "Faxi Centurion Filterbank" file in any of the files that are still available in your link. The last one (Various Faxi Mod Patches and Packs) is not available anymore.